Right From The Start/ Desde el Principio (RFTS) provides education and family support services to at-risk families who are expecting a baby or who have children and live Highland Park, Highwood and north Lake County communities including Round Lake, Waukegan and North Chicago. The program aims to promote healthy family functioning, healthy prenatal outcomes for pregnant women, and enhance the development of children. Intervention and prevention-based services are provided for parents, primarily mothers, who may be facing obstacles such as: cultural and languages barriers, isolation, single parenting, financial struggles, and postpartum depression. Movement and Music class as part of the Right from the Start program. RFTS was created in 1994. The program was created in response to the unmet needs of the growing Latino population of Highwood and Highland Park. In the beginning RFTS started with hospital visits then progressed to home visits, prenatal groups and a parent education group as well.. RFTS has grown and diversified its services by continually assessing our families’ needs and planning new strategies to help fulfill service gaps encountered by our participants. Currently the program serves around 250 families, provides hospital visits, home visits and groups that promote the families’ well-being. All our services are free of charge. Transportation and childcare are provided for all groups. We provide information and support in a culturally sensitive atmosphere with a comprehensive curriculum tailored to the needs of immigrant mothers. Parents are provided with information on a diverse range of topics. Included in this group we have “Family Literacy” sessions which are provided by the Highland Park Public Library. They are facilitated by a story-teller and include puppets, songs, and crafts. Clients can borrow books from our lending library. Additionally, parents have the opportunity to network with other parents and discuss issues with various speakers. We support families following delivery at Highland Park Hospital. Families are followed up with during subsequent home visitors. This weekly group meets with parents and their children age 0-3 and provides the children time to play in a classroom setting with activities including literacy and music. Parents participate in parent/child activities and have opportunities to learn about subjects related to the development of young children. In collaboration with the Township High School District 113 we offer ESL classes to help our clients get acculturated to living in the United States, secure better jobs, and keep up with their school age children. This class includes a lap sit section where parents read books to their young children. We provide transportation and childcare making our ESL class unique and more accessible than others in the community. Many parents obtain their GED certificate that will help them to advance their studies. We provide our families with information and referrals to other service providers within the community and advocate on their behalf when needed. Our dual language mornings take place on Tuesday and Thursday mornings. Children enjoy developmentally appropriate playtime in two classrooms with bi-lingual staff and monthly themes. These groups promote integration between children and parents of different backgrounds. 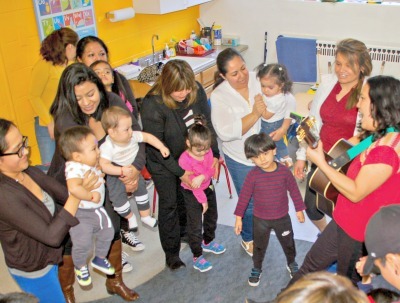 Children are exposed to songs and stories in English and Spanish. Home visits are offered on a flexible schedule to accommodate individual family needs and focus on helping parents develop a healthy parent-child relationship. Family Support Workers, using the Parents as Teacher’s curriculum, provide families with information about child development. We also make referrals to outside community services. Home visiting is available to parents with children from age 0 to 3 living in the area around Highland Park and Highwood, and in northern Lake County including Round Lake, Waukegan, North Chicago and Zion. This group informs parents about preschool program options in the community and helps them prepare their children for the new experience. Jessica Rios – Bio coming soon! Ana Soto has been working with RFTS since 2016. She holds a B.A. in Social Work from Northeastern Illinois University. She has experience working with the Latino community. She is bilingual/bi-cultural and grew up in the Highland Park/Highwood area. Ana loves to help families by providing them with tools and resources for their children to have successful futures. Gabriela Zepeda – Bio coming soon! Griselda Zuluaga – Bio coming soon! Miriam Vergara – Bio coming soon! Dinora Arias has worked with the RFTS program since 2007. She has a BA in Accounting from her native country, Mexico. She is a dynamic person who helps us with the transportation of clients, as well as a great childcare giver who understands the needs of our participants’ children. Marilú Betancourt has worked with us since 2004. She has an associate’s degree in Tourism from her native country, Mexico. Everyday she enjoys teaching and learning from the children. She is warmhearted and cares for children as if they were hers. Volunteers are always welcome. Please call us at (847) 681-0890 if you have an interest in being a Right From The Start Program Volunteer.